How did you find out about Vagabonding, and how did you find it useful before and during the trip? I first heard about it through Tim Ferriss’ blog and book, The Four Hour Work Week. It was in the “recommended few” reading list. Since I was already kind of vagabonding at that stage, I thought it sounded great. It was. The stories and quotes were inspiring, and I followed up by reading some of the books mentioned. I especially liked reading The Snow Leopard while trekking in Nepal. How long were you on the road? It depends. I lived in Japan for 3 years, which was fantastic but didn’t really feel like vagabonding to me. I was working as a high school teacher every day. After Japan, I was on the road for about a year and a half. What was your job or source of travel funding for this journey? By far the biggest source was my savings from teaching English in Japan. The salary was pretty good, and I saved quite hard for my 2nd and 3rd year there. The money goes a long way if you are not always flying from country to country. Did you work or volunteer on the road? Apart from in Japan, I volunteered in India and Nepal. Mostly teaching English. It was just volunteering, not swapping services for rent. In fact, I did do one of the volunteer programs that you pay to go on. There’s quite a lot of debate about whether you should pay to volunteer or not, so I tried both. In summary, they were both great experiences for me. Of all the places you visited, which was your favorite? Best place to live: Japan by far. 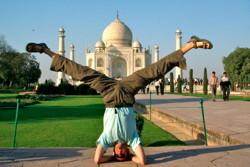 Best place to visit: India – They say you either love it or you hate it, and I loved it. Maybe it was because I met so many loving people, or because I really enjoyed the yoga, or the food, or the energy or the colour, or maybe all of that mixed together. Was there a place that was your least favorite, or most disappointing, or most challenging? I had high expectations of China. I thought I’d love it, and I met some great people, but China and I, we just didn’t really click. I loved Hong Kong, but that’s not really China, and the Olympics were amazing, but that’s not really China either. Maybe I don’t know what China really is, and I would definitely go back, but I thought China was tough. Did any of your pre-trip worries or concerns come true? Did you run into any problems or obstacles that you hadn’t anticipated? I’m not sure I can even remember what my pre-trip worries were, but I did get sick in India, I did get scammed in China, and I did fall in love in Japan! That last one probably was not a pre-trip worry, so much as happy occurrence! Which travel gear proved most useful? Least useful? Backpack obviously! I didn’t tour with my laptop, but if I went again, I’d like to take a sturdy little notebook, or maybe even just a iPhone. Wifi is everywhere. Obviously don’t go traveling with your phone contract still on, or it will cost you a fortune! But to have a handy little camera, map, books, music all in an iPhone or iPod is really handy. Least useful: umbrella! What are the rewards of the vagabonding lifestyle? (Laughing) If you have to ask then you’ll never understand… To view the world in a different way. It will impact your life like nothing else can. It will forge the direction of your prevailing careers. It will open a myriad of global relationships. It will affect your choice of future lovers. It will clear the clutter from your mind. It will reveal your true passions. All this and more..
What are the challenges and sacrifices of the vagabonding lifestyle? Challenges: Sustainability. How does one continue to pay for this life rocking experience? That’s why I came into vagabonding from The Four Hour Work Week. The book is a kind of business manifesto for the vagabond. Earning a living from anywhere with a few hours work at your computer? A dream for many people, and I’m still not there. Tim Ferriss if you’re listening..help! Sacrifices: Career progression? Possibly. It can be difficult to come back to a competitive job market. Peers have one (or four!) years experience on you. You probably won’t come in at their wage level, if that’s what you chose to do. However, and it’s a big however, when/if you do come back, you are much more likely to be doing the things you love, rather than doing the things you thought you should be doing. What lessons did you learn on the road? All of the above. If you can make friends with someone who doesn’t speak your language, you can make friends anywhere. How did your personal definition of “vagabonding” develop over the course of the trip? At the start, vagabonding was just backpacking. But backpacking doesn’t always take into account the slowness, letting a new place wash over you, and spending time in your own company as well as with new friends – that’s what vagabonding means to me now. If there was one thing you could have told yourself before the trip, what would it be? I wouldn’t! I liked the surprises – that’s all part of the adventure. Any advice or tips for someone hoping to embark on a similar adventure? Go slow. There’s so much to see and do. Have you seen that book – “1000 natural wonders to see before you die”? 1000? OK, so if I do one every week for the next 20 years or so that should cover it.. ridiculous. Sure, you can see a place, tick, move on, new place, tick move on, but that’s not the way to vagabond. So go slow, relax and enjoy yourself! Are you a Vagabonding reader planning, in the middle of, or returning from a journey? Would you like your travel blog or website to be featured on Vagabonding Case Studies? If so, drop us a line at casestudies@vagabonding.net and tell us a little about yourself. Travelling slow is so important. One country slowly is wayyy better than 5 short trips. This is why I hate weekends away – they are never long enough to get to know somewhere.